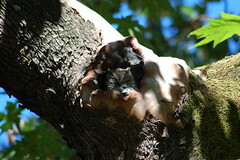 When you're walking along a certain trail in Briones Park, it's a good idea to look twice at a certain hole in a certain madrone. step out onto her wonderfully sculpted front porch for a breath of fresh air. 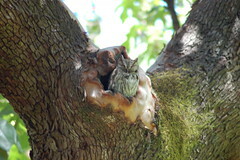 Someone might be a western screech-owl. That's fabulous -- good for you for remembering to look! Credit Joe, basically. I knew it was, um somewhere in there. He got to say "Bingo." Also credit the owl, who was very calm and obliging. After your first sentence, I found myself thinking, "Who? Who?" Hey, Ron, should this go in the Ravenna report? If so email me a high rez by tomorrow morning.